Andrew Nethsingha and the choir of St John's College, Cambridge have recorded Vaughan Williams' Mass in G minor as part of an all-RVW disc which is being issued on the St John's College label this month, and forms a follow-up to the choir's Poulenc, Kodaly and Janacek disc which came out last year [see my review]. Whilst I was in Cambridge for the college's Michael Finnissy day, earlier this year [see my article], I took the opportunity to catch up with Andrew to find out more about the new recording. Whilst Andrew felt drawn to the RVW Mass, one of the reasons for recording it was that the choir has not recorded it before. Christopher Robinson, who was the choir's director of music from 1991 to 2003, was going to record it as part of his sequence of British choral discs which the choir recorded for Naxos, but the RVW recording never happened. And as the choir has made 98 discs (they recorded over 60 CDs or LPs with George Guest who was director of music from 1951 to 1991), Andrew points out that there are not many works which it hasn't recorded at some point. 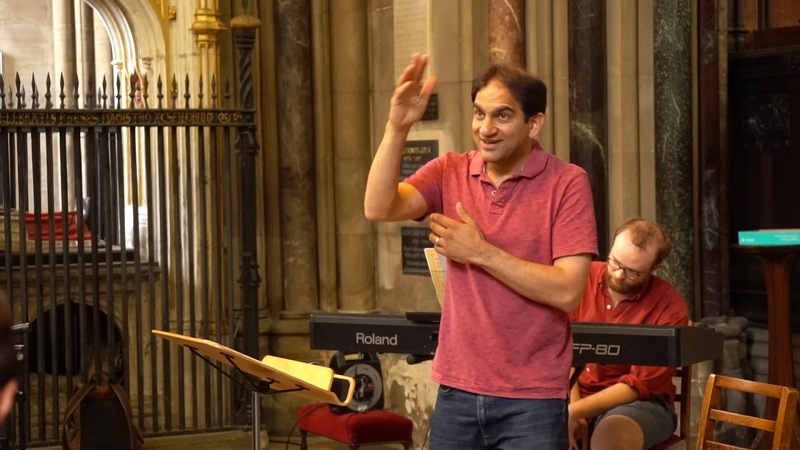 In fact, Andrew was previously director of music at Gloucester Cathedral, a place which has strong links with RVW including being the venue for the premiere of the Tallis Fantasia. But RVW also played a significant role in the history of the choir of St John's College as in the 1950s, when the college was considering closing the choir school, it was a telegram from RVW which was highly influential in keeping the school open. Andrew was also intrigued that though RVW's music is much written about, musicologies tend to concentrate on the symphonies rather than the choral music. He feels that there used to be a similar issue with RVW's songs, but these are being re-assessed. Andrew regards the mass as a hugely significant piece and thinks that we sometimes forget just how innovative the work was with little like it previously in English choral music. And in the way RVW orchestrates the vocal parts, Andrew detects hints of RVW's period of study with Ravel. Andrew sees the inspiration behind the mass as being the reaction to World War One, a feeling that people were searching for reasons. He points out that RVW wrote little liturgical music before the war but after his harrowing experiences when he was an ambulance driver for the Royal Army Medical Corps, there was suddenly an outpouring of religious music even though RVW was an agnostic. And Andrew feels that the underlying bleakness and melancholy in the work points to the way RVW was trying to answer the questions raised by his war experiences. And on a practical point, it made sense to record the piece to link in with the centenary celebrations for the end of the war. RVW's writing in the mass and other sacred works from the period, such as O vos omnes (which is also on the disc), has often been criticised for being overly discursive. But Andrew realised that the meandering, searching and directionless qualities in the music was something quite deliberate, with RVW making the music very different to the classic Western European goal-oriented style of writing. And Andrew thinks that his slightly aimless quality reflects an attempt to deal with such issues arising from the war as shell shock. 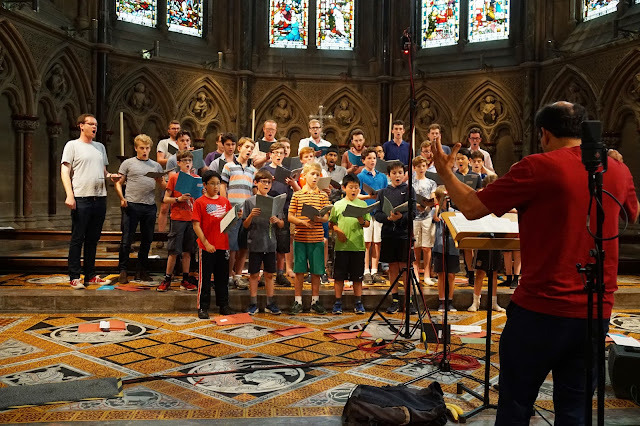 When recording a piece, Andrew likes to be the opposite of rehearse and record, preferring that he and the choir live with a piece before recording it, and thus they can get a creative depth in their performance. So for the RVW Mass, preparations started two years before the recording, and a significant number of performances were given including seven in the USA. Andrew likes to get a work into his bones. RVW had a strong feeling for texture and colour, and a feeling for the sense of space in the architecture of a building and how to use it. So with RVW's links to Gloucester Cathedral and Andrew's knowledge of the building from his time there, Andrew tried to imagine the work in that building when it came to doing the recording. So there is a great sense of space in the recording, partly inspired by RVW's writing for a similar grouping of soloists and ensemble in the Tallis Fantasia, though in the mass RVW leaves it up to the conductor to decide the distance between the groups. So they experimented, with Andrew trying to use the space in an imaginative way, and he is confident that RVW would have approved. In the 'Agnus Dei' the soloists at the end are somewhat in the distance, and here Andrew was thinking of the distant voice at the end of the Pastoral Symphony. For the more mystical passages such as the 'et incarnatus est' in the 'Credo', Andrew placed the soloists differently to the rest of the movement to highlight the passages difference. Similarly, in the 'Gloria' in the move from the opening section of the central slower section with soloists, Andrew drew on the idea of the music slowing down reflecting people genuflecting and being more prayerful so that bass solo comes out of this. For the beginning of the mass, Andrew hates performances which sound clinical. The 'Kyrie' opens with a solo line for the altos, and Andrew was interested that as a former viola player, the viola plays a significant role in RVW's music and he thought that the melodic alto lines in the mass have a similar feel. So the altos start the 'Kyrie' out of nothing, and the similar passage at the very end of the mass also goes off into the distance. 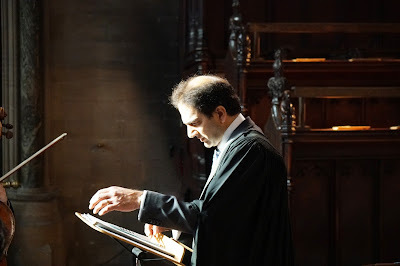 Andrew has been at St John's College for just over 10 years when I ask how the choir has changed he comments that in some ways it has changed a lot and in some ways not at all. He did not deliberately set out to change anything, and one of his greatest pleasures is when former choristers come back and say that the choir sounds just the same as it did in Christopher Robinson's time. Andrew tries to preserve the imprint of George Guest's musical personality on the choir, the warmth, emphasis on the words, laid-back feel, red-blood and expressive. 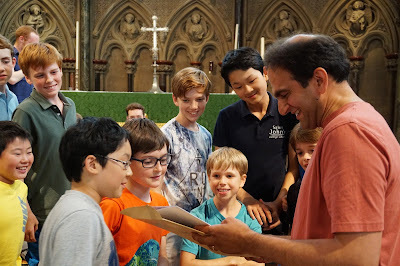 Every day, Andrew talks to the choir about the parallels between what they are doing now and how the choir sounded in the past, and he feels that it is important for them to know. He feels that if you compare the choir's recent (2017) recording of Jesus Christ the Apple tree with its 1986 Chandos recording you would find a lot of similarities. But each conductor has had a different musical personality and has emphasised different repertoire. Christopher Robinson and the choir made that important sequence of discs of 20th-century English music. Whereas Andrew has focused on the music of Jonathan Harvey, and done a lot more new commissions than previously. Also, he has introduced the Bach cantata evensongs, each term they do a Bach cantata in the context of Evensong with a period instrument ensemble led by Maggie Faultless. Andrew also tries to keep things fresh, introducing new ideas, recent music has included a piece by Telemann with theorbo and one of his Lubeck cantatas with trumpets, a new piece with cello, a piece for choir and timpani, Bernstein's Chichester Psalms in the version with organ, harp and percussion, and a piece for choir and double bass. Many of the new pieces are commissioned from student composers at the university. All this would seem a lot of work for a choir where the treble line is taken by young boys (generally aged 8 to 14). Andrew admits that they are wonderful, and he tries not to make things too stressful for them. He gets the boys for two hours per day (split between sessions before and after daytime schooling), six days per week and he regards these sessions as very much being teaching. The secret is to plan well in advance so that they are already preparing for the choir's big Advent carol service (which is broadcast on the radio) which takes place at the end of November, and they started preparing a year ago for the Tallis Videte Miraculum which they performed alongside Michael Finnissy's new anthem at the service on 3 February. These long lead times mean that they can work out how to do things so that by the time of the performance the boys do not feel stress and know exactly how to do it. 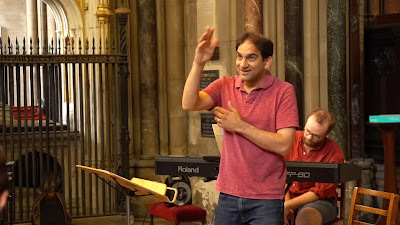 Andrew points out that people sing better when they are relaxed and not stressed, so this approach helps the boys sing with a greater sense of freedom. If they tense up, you can hear it in the sound, and his overall approach is to be warm, friendly and human, rather than being dictatorial. 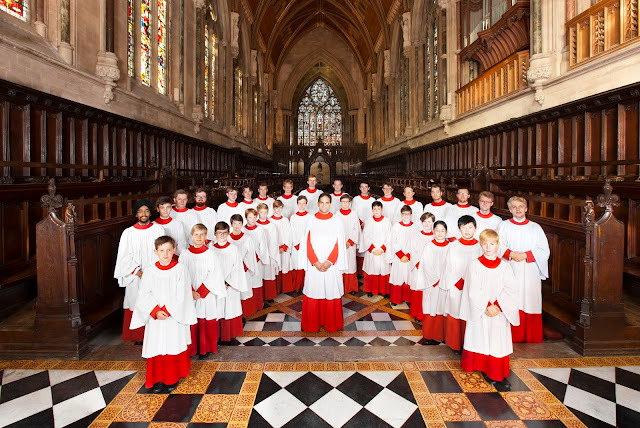 There is a special Evensong in the chapel of St John's College, Cambridge on 18 May 2018 to celebrate the release of the new disc of music by RVW, and the service will include music by RVW alongside music by his teacher, Stanford. Full details from the choir website. Vaughan Williams - Mass in G minor - available from Amazon. Christmas with St John's - available from Amazon.